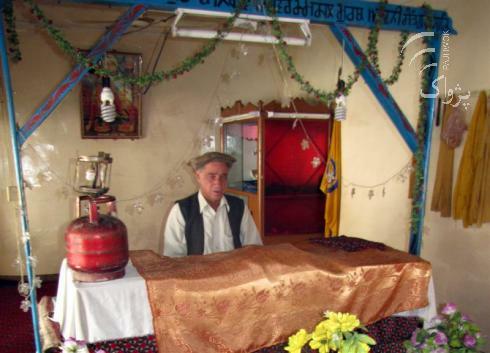 KHOST CITY (PAN): Bagwan Dase, 64, is the only Hindu left in eastern Khost province. The hundreds of others, he says, fled after warlords seized their homes and lands and “we fear to ask for the return of our properties”. Dase sits in a Hindu temple in Prim Nagar village, east of Khost city. Before 1978, Prim Nagar was known as one of the most beautiful villages in the city, but after decades of war, it now lies in ruins. Dase, who was born in Khost, stays because he has a job — securing the empty houses of the Hindus who have left — for which he receives 14,000 afghanis per month. He lives alone, because his family is in India. Hindus and Sikhs have lived in Khost for centuries. They dress the same as Afghans, but worship different gods and speak a different language – although many do speak Dari and Pashto as well. Sayed Amin Mujjahid, deputy of the Afghan Academy of Science, says that after Afghan King Mahmood Ghaznawi conquered India in 1025 and broke the Somanthe statues, he was followed back to Afghanistan by many Hindus and Sikhs. Then in the 1760s, during the reign of King Ahamd Shah Baba, some Hindus and Sikhs joined the army and also settled in Afghanistan. “The third reason that Hindus came to Afghanistan was that whenever the Hindus clashed with their government, they came to Afghanistan where the government gave them land and other privileges in areas now considered Pakistan,” Mujahid says. The Hindu-Sikh population was estimated to number around 200,000 in 1990, but now there are between 1,500 and 3,000. Before the Communist regime in the mid 1970s, 243 Hindu families lived side by side with Afghans in Khost, Dase says. However, after the 1978 coup, due to the poor security and restrictions on their ability to follow their religion, some Hindus left. In contrast, when the Taliban took power in 1996, Sikhs and Hindus were free to practise their religion. They had no fear about security either. However, the Taliban did force them to wear yellow stars to make them easily distinguishable from Muslims. When Dr. Najeebullah’s government collapsed in 1991 during the decade- long civil war, Base says his properties were looted. A Hindu temple in Khost also was destroyed in 1992, at the same time as some extremist Hindus demolished the Baber Mosque in India. “Due to economic problems, Hindus from Khost emigrated to Pakistan, India and other parts of the world,” Dase says. Only 33 of the original families from Khost have remained in Afghanistan, and most are in Kabul, probably one of the safest places for Hindus and Sikhs. Although some Hindu families remained in Khost, the lack of jobs, assaults by warlords on their properties and the worsening security forced them to move. In Latako area, more than 187 acres of land belonging to Hindu families were seized by warlords, Dase says. He says if any of the land owners even contemplate asking for their property back, they will be kidnapped and threatened with death. Royal Sang, the assistant of the Hindus Council in Afghanistan, says it is true that Dase is the only Hindu in Khost. He blames the seizing of their lands by warlords, the poor security and lack of jobs for why Hindus left Afghanistan. According to him, another problem is lack of schools for Hindu children. But life is not much better in India. “We are treated as Afghan refugees in India, we are not given any sort of privileges, we are not happy there. When Afghanistan becomes stable, we will return,” says Dase. He wants the government to take their back their land from the warlords. Yousef Molater, an official of Human Rights Association in the southeastern zone, says it is the government’s responsibility to protect the rights of Hindus. “The Hindus are citizens of Afghanistan and they should be prevented from emigrating and the government has to provide opportunities for them to them return and live in safety,” he says. Hindus have rights just like anyone else in the province and nobody can oppress them, Abdul Jabar Naeemi, the governor of Khost, says. “If they have documents for grabbed lands in any part of the province, I will return their land to them,” he says. However, although the Hindus say they have complained to the government, Naeemi denies this. The governor says he hopes the Hindus will return to their former homes and take part in the reconstruction of the province. Gen. Abdul Haqeem Eshaqzai, the police chief, also says that if the Hindus have any security-related problems, they can tell him and he will resolve it. But again, while the Hindus say they have complained to the police, the Eshaqzai denies this. There have been some success stories. During the recent parliamentary election, two Sikhs stood for the lower house, and more recently a Hindu was selected to advise President Hamid Karzai on economic affairs. Most Khost residents say they are saddened by the stories of torment that the Hindus suffer and would like them to be able to return. Hajji Juma Khan,72, a resident of Sabari district, says he has good memories of the Hindus. “I wish the Hindus would return to our village. They were very good and harmless people,” he says. Hasamuddin Rahimzai, a professor of the Islamic Sharia department at Khost University, says the harassment of Hindus was not only a violation of their human rights but also an act against Islam. “What was done is in the past, but in the future I hope the Hindus who left Khost will return,” he says. A TEENAGE Westminster college student who fled violent persecution by the Taliban fears he faces “a death sentence” if he is deported to Afghanistan. Mit Singh Chopra, 19, a student from Westminster Kings­way College, came to the UK after being kidnapped and beaten up in Afghanistan because of his Sikh religion. He said he was taken by extremists from a village in that country and held for eight days and they tried to force him to convert to Islam but he managed to escape. Sikhs, along with other minority religions, were once able to live relatively peacefully in Afghanistan but over the past three decades there have been reports of violence against them. Mr Chopra is currently being held at the immigration removal centre in Harmondsworth, near Heathrow , and is expected to be deported in five days’ time. Pupils and teachers at WKC – which has bases in Victoria, Regent’s Park, Soho and St James’s Park – have mounted an urgent campaign that has included a protest outside the Home Office in Marsham Street near Victoria on Wednesday, attended by about 40 people. On Tuesday Mr Chopra, who has been praised by his teachers as “gentle, polite and caring”, said he would rather die than be sent back to Afghanistan. 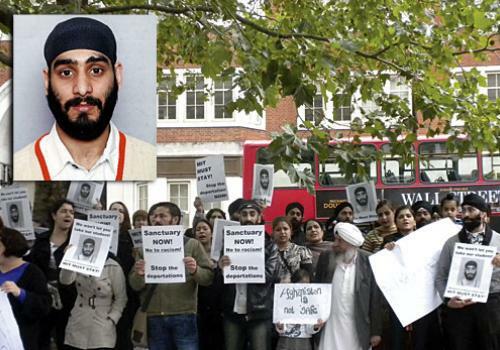 The UK Border Agency said Sikhs, including Mr Chopra, who came to the UK in December 2007, face no danger in Afghanistan, though it acknowledges reports of discrimination. In an emotional phone conversation with the West End Extra on Tuesday, Mr Chopra, who suffers from post traumatic stress disorder, said the detention centre was “like a prison”. Despite arriving in the UK almost three years ago, Mr Chopra’s asylum claim was not heard until last year, when a tribunal judge ruled that he was ineligible to remain in the country. An appeal against this decision was unsuccessful. Two of Mr Chopra’s brothers are British citizens and a third has indefinite leave to remain in the UK. The whereabouts of his parents is unknown but he has no known family left in Afghanistan. WKC access support officer Karen Doyle said Mr Chopra, a student of English, was “the nicest person you could imagine meeting”. A spokeswoman for the ­college said: “We recognise that a lot of our students feel strongly about this case and that they want to support one of their fellow students. Unfortunately, it would be inappropriate for the college to get involved directly.